There's plenty for visitors to do anytime of the year in Alaska. , Winter's may be cold, but you can still go hiking, snowmaching, skiing and explore our winter wonderland. Spring is filled with festivals, exploring and great bargins. The summers are round the clock enjoyment, fishing, rail tours, horseback riding and more. 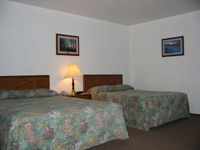 Call us ...we offer some off-season bargains at the Eagle River Motel. Check them out! * Every room contains a microwave, coffee pot, and refrigerator.